Big and rusty, it sits on a small kitchen space with other decorative items. Some have questioned its presence, as it isn’t particularly attractive. Beauty is in the eyes of the beholder, they say. I was on the Atlantic coast of Canada beside an old lighthouse that is now just a tourist attraction. There in the sand, I found it. Huge compared to normal nails, it had probably been washed up by waves. In my eyes, it could be a hundred years old or more. It spoke to me of history, of outlasting modern technology. I imagined that time-worn object holding together a historic structure such as the blockhouse in the same town, or as part of the old wharf that burned down and had to be rebuilt. Its tip was blunt and not sharp, so one might call it a metal peg. For some reason, it reminded me of the Cross. The nails that pierced Jesus’ hands and feet must have been gigantic, like this one. No nice slim “needles” that went in easily. Nasty, tearing apart flesh and tendons, with blood pouring forth. I don’t mean to be gruesome, but it’s a fact. One day I was leading the service at our little church, and I took my nail or peg as an object lesson before the Lord’s Supper. “Hold it as if it were piercing your hand. Think upon what it meant for our Lord’s hands to be pierced”. My brethren passed it around. No one told me how they felt, but to me it was a strong reminder of the reality of what becoming human meant for the Messiah. It meant sharing our pain and bearing our sin and agony. Not everything we possess or display is supposed to be pretty. Some objects are a piece of nostalgia: old letters, a crude drawing by a preschooler, a snapshot of a scrawny newborn. They often speak to us of love. There are those who insist that Christians should not use the cross as a symbol, especially as a piece of jewelry. My husband once said, “If someone you loved had been murdered with a gun, would you wear a gun in their memory?” I respect that point of view, but it differs from mine. The “old rugged cross” has spoken to many across the ages. Rusty nails can also bear a message. Simple objects can be reminders. Mexicans don’t worry much about political correctness when it comes to holidays. Two of the big ones are Semana Santa (“Holy Week”) and Christmas. They may have become more secularized over the years, but their names still denote their Christian origin. Another distinguishing characteristic is that they tend to last longer than in many other parts of the world. “Christmas vacation” isn’t just a few days or a week long. If you’re a student or teacher, you may have up to three weeks free! It’s also the time when many employees look forward to their annual aguinaldo or Christmas bonus, so spending is at the max. One custom I heard about my first year in Mexico was that of posadas. Traditionally, these are nine days of religious ceremonies or processions where believers travel to different homes and “ask for posada” or lodging, reenacting Mary and Joseph’s search for a place to stay. Hand-held candles light the way. At each place they sing, asking for lodging, until finally they are accepted. There a celebration is held and piñatas are broken gaily. That’s the tradition, but as I discovered, in reality nowadays the term posada is often used for a pre-Christmas party of any kind! In fact, I have rarely seen the type that is described above. Mexicans love to party, and as some have observed, they may be “broke” when it comes to anything else, but there’s always enough money for a party! There’s a humorous phrase that’s surfaced in recent years to refer to the extended holiday season: “el puente Guadalupe-Reyes”. Usually puente (“bridge”) refers to a long weekend, but in this case it refers to this extended time of celebration between December 12th (the feast day of the Virgin of Guadalupe) and January 6th, Epiphany or Kings’ Day (Día de Reyes). In particular, food lovers will joke that it’s the time to abandon diets for a while! Some celebrate Guadalupe day by making pilgrimages to the Basilica in Mexico City, but most cities have a church dedicated to this virgin and will have fairs with food stands and games set up around it. Parents will dress their children up in Indian costume to represent Juan Diego (or a feminine counterpart) to visit the church. Those who are in the know will avoid driving anywhere near such sites at that time of year! From early on in December, dinners and parties abound, so that it’s hard to plan anything without many guests apologizing because they have a commitment. (My birthday is on December 11th, so I should know!) Schools, companies, offices, churches, groups of friends… each wants to celebrate! The culminating activity, family-oriented, is Christmas Eve. Taxi rates soar on December 24th. From days beforehand, markets and stores bustle with shoppers preparing for the feast. Roast leg of pork is a favorite, though turkey is another option. A popular and eye-catching salad is ensalada de Nochebuena (Christmas Eve salad), which includes beets, oranges and peanuts, among other ingredients. Stuffed chiles are also common fare. A dish I had to get used to is bacalao or bacalao a la vizcaína, a complex and pricey mix of salted codfish, tomato, chiles, capers and more. The codfish, preferably Norwegian, is previously soaked to reduce the salt content and then shredded or cut up and seasoned as it cooks. 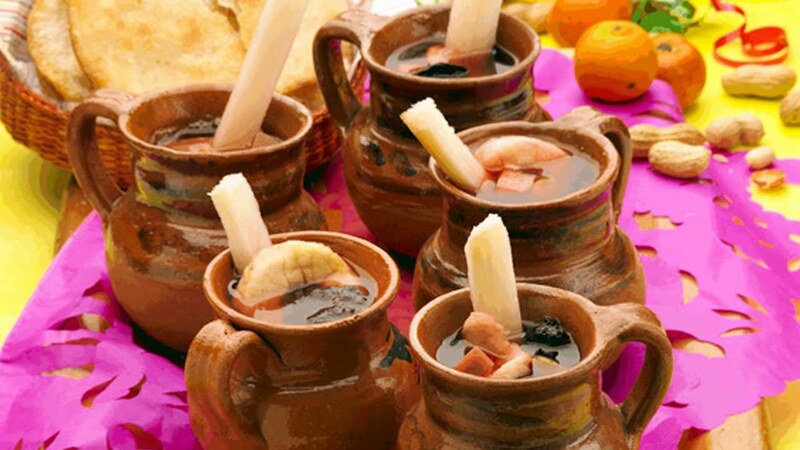 The most typical beverage of the season, which I only get to enjoy two or three times a year at most, is ponche, a hot punch which is chockfull of fruits such as guavas, apples, sugar cane, small yellow tejocotes, and sometimes tamarinds or hibiscus flowers. Spiced with cinnamon and sweetened with panela or piloncillo, this hits the spot on cold winter nights. Each family has its own Christmas traditions. Catholics may sing a lullaby to the Christ child in their nativity scene. Others may have a posada with small candles and songs. Where there are children, a piñata is a must! Peanuts and miniature fruit are the traditional filling, but nowadays candies and such often take their place. Sparklers, sky-bound lanterns and firecrackers add to the light and sound. A more modern type of entertainment for some families is an after-dinner karaoke sing. What about gifts? That depends. Some groups or families organize a gift exchange at any of the smaller Christmas parties. Either the 24th or the 25th, there may be gifts under the tree, especially for children. Santa Claus, a more recent import, may or may not be involved. In the past, “el niño Dios” (the Christ child) was said to bring presents, but I haven’t heard of that tradition among our acquaintances. It strikes me that, as with American or Canadian Thanksgiving, the focus is mostly on eating and socializing, just enjoying family. That takes the pressure off too much expectation of gifts. What kids look forward to most is January 6th, el Día de Reyes! (A little-known fact is that it is the the Twelfth Day of Christmas in Western tradition, with December 25th being the first day.) It’s those “three kings” or magi who really bring toys and such, as far as most are concerned. Our Mexican relatives, at one point, gave the little ones clothing items such as PJ’s for Christmas, so January 6th was the BIG day for presents. So, much as you’ll see lots of Santas in malls and elsewhere, after Christmas you’ll begin to see trios of men in costume, even in the main square or zócalo, offering photo ops and more. One inevitably is dark-skinned or has his face painted black, as the legendary Baltazar (Balshazzar) is of African origin. His companions are Melchor and Gaspar. 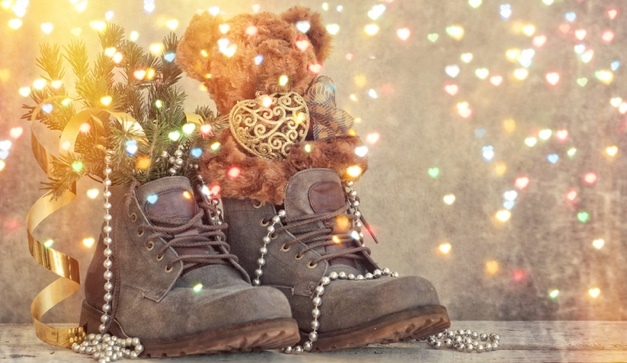 On the eve of “Reyes”, children will put out a shoe for the kings, ideally with their letter of gift preferences. Food will be left out for the horse, the camel and the elephant: peanuts, hay or grass, water, etc. In more recent years, it became popular to buy helium balloons the day before, put their wish list inside and send it to the heavens. Probably that was invented by balloon-sellers! It has been fun to see multi-colored globos drifting upwards at this time of year. However, the latest trend is to promote a return to the traditional “letter in a shoe” as more eco-friendly. The last diet-quashing goodie of the season is the rosca de reyes, a ring cake or sweet bread in the shape of an oval wreath. It is meant to represent the elaborate headdress of “the kings”, with colorful candied fruit (figs, candied fruit strips, etc.). It’s delicious, usually made with agua de azahar (orange blossom water) as well. Usually this is accompanied with hot cocoa. The special emphasis is on the plastic baby doll (now, several babies!) representing the Christ child, hidden from Herod. In Spain, the tradition was to have a large haba or fava bean in the cake. Each person has to cut their own piece of rosca, and those who find the figurine are supposed to host the party or contribute to the tamales on February 2nd! Wait, February 2nd? Right, Candelmas or the day of the Virgin of Candelaria. Were the tamale-makers jealous of the bakers? Anyway, for some reason it’s traditional to celebrate with tamales on that day, perhaps with the excuse that they are wrapped up like the Christ child? Catholics dress up a rather large image of the Christ child on that day to have it blessed in church. In the end, we might say that the season lasts longer than I first mentioned! Perhaps we should call it the “puente Guadalupe-Candelaria”?